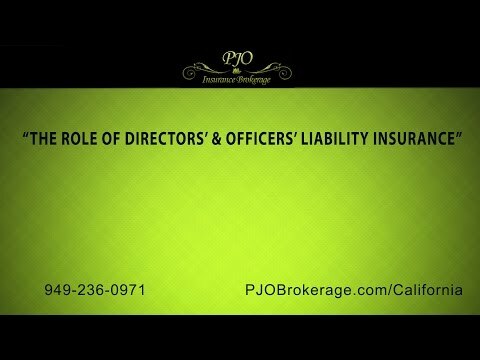 When looking at the history of Directors and Officers Insurance in California you have to go back in time more than eighty years. After the Great Depression, which was a very difficult time for both individuals and businesses alike, Congress, in 1933 and 1934, created laws that were designed to protect the investors. A direct result of these actions were that Company Officers and Directors needed to have a much higher fiduciary responsibility to ensure they were doing things correctly with that increased liability with these new regulations. With this new exposure concerning Officers and Directors, insurance started being offered for this type of risk. In this period of time, there was little litigation, and, thus, demand for this type of insurance coverage was low. In the 1960’s, the demand for Directors and Officers Insurance coverage began to increase due to changes at the state levels, and companies other than Lloyd’s of London started to offer this coverage. Now with the stock market crash in 1987, things changed again. With a wave of claims hitting carriers, many of the top ten D&O carriers got out of the market, leaving choices slim, and rates went up drastically, some as high as two hundred percent. Now, just consider what has happened over the past ten plus years. We have had the financial meltdown of 2007 and 2008, when at least one major financial institution went totally under, two major auto manufacturers declared bankruptcy, and banks wrote off hundreds of billions in bad real estate loans. With this financial upheaval, there were more lawsuits filed against companies than in the previous fifty years. With the way shareholders are currently taking a pro-active role in what companies are doing, the smart and fiscal direction to take would be to have the proper Directors and Officers Liability Insurance Coverage in place. Directors and Officers are responsible for managing their companies and, in certain cases, could be liable to a significant risk of personal liability for such actions and any costs related to any settlements, judgements, and defense costs for legal proceedings, and the legal fees for these lawsuits can easily top six figures in a short time. Directors and Officers of the company, while acting as fiduciaries, have a sworn duty to their shareholders to avoid all conflicts of interest and hold themselves accountable to a code of conduct that provides for care and diligence in the management of the company’s affairs. Elected by the shareholders, Company Directors and Officers have a fiduciary responsibility to manage the company with the shareholders’ interests first. Responsibilities for the directors would be to review the company’s business plans and goals and to see that the company’s officers are following through regarding those plans and goals. In this type of set-up, the role of the company directors would be to serve as link between management and the company’s shareholders. A brief example of the responsibilities a company director would have is to evaluate the management’s performance, establish company procedures and policies, while overseeing the financial condition of the company. As you can see, the role of a company Director or Officer carries a very high level of responsibility, and another high priority should be the proper amount of insurance coverage. One common claim that is brought against Directors and Officers is in the area concerning a breach of duties involving their loyalty to the corporations they are supposed to have and making sure the company’s interests always come first. You may ask how a director or officer could breach their responsibility. A couple of examples would be if they revealed propriety information or insider information to a person outside of the company, a loan approval given to one of the directors or an affiliate of theirs taken from the company’s accounts at under market rates that are not available to others, and either ordering or receiving improper payments to gain an unfair advantage. One other area of concern would be those people who serve as Directors and Officers on boards of Non-Profit Organizations. Just like their for-profit company brethren, these Non-Profit Directors and Officers must commit to protecting the organizations they serve, and because of their roles, they could also face criminal or civil liability for certain omissions or acts. One example of a claim that might be filed against a Non-Profit Director would be if that person were allegedly giving an authorization to attempt to influence the state legislature, that a passage of a bill could benefit the non-profit organization, but at the same time could also put its tax-exempt status in jeopardy. Another example would be if a director pledged the non-profit’s assets to secure a loan for their business. As most know, the individuals who serve as Directors and Officers on profit and non-profit companies, alike, face a significant litigation exposure. When these claims and lawsuits are brought against them, they are both very time consuming and, usually, are very expensive to defend. Having the proper Directors’ and Officers’ Liability Insurance in place will be a very wise and prudent course of action. To learn more about this type of Orange County business coverage, please call PJO Insurance Brokerage in California to discuss your options.